Murphy Cowen finished fourth overall in the Intermediate Fleet at last year's event. After the regatta was cancelled and rescheduled due to extreme heat on the Australia Day long weekend, the Musto South Australian Optimist States will take place this weekend at the Adelaide Sailing Club. The weather is looking wild and windy, however the 52-strong entry list is still raring to go and keen to cap off what has been a great local season of junior sailing. 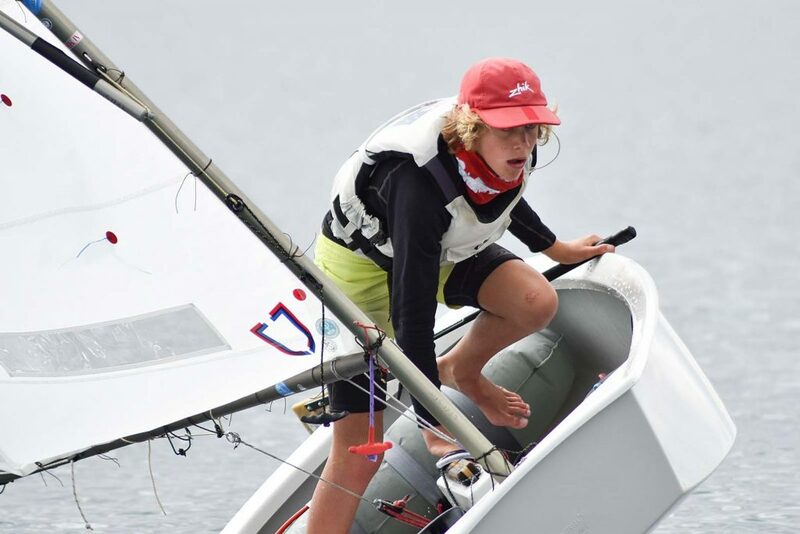 It has been a busy year for the local Optimist sailors with the national championships being held in Queensland in January, a busy local regatta circuit with the SA Youth Tri Series and SA Youth Championships, as well as considerable club racing and training. 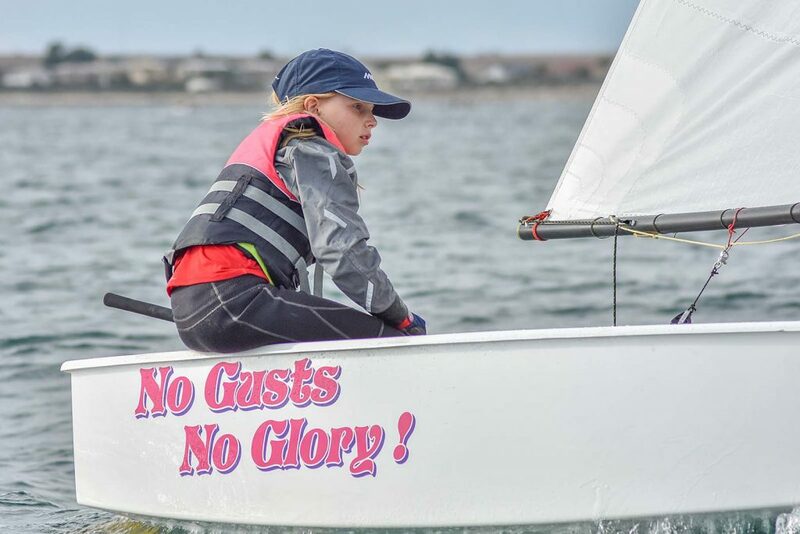 The class state championship this weekend will cap off the local season, but also give a few of the sailors some final regatta preparation before they head overseas, some for world championships and others for various other overseas regattas. Last year’s state champion, Quinn Auricht, will head to the 2018 Worlds in Cyprus throughout August and September after finishing third in the nationals in Queensland. He finished second in last season’s nationals and also competed in the worlds, which means he will be a two-time Worlds sailor after this season. 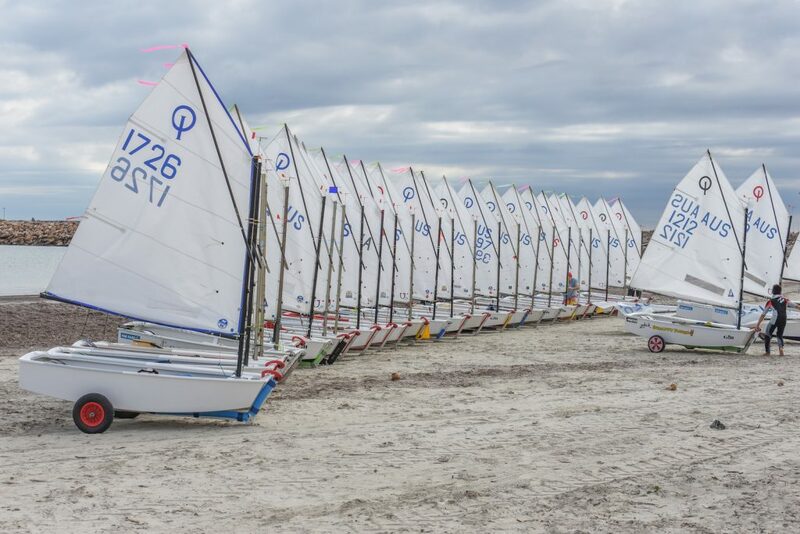 Boats lined up on the beach at last year’s States. 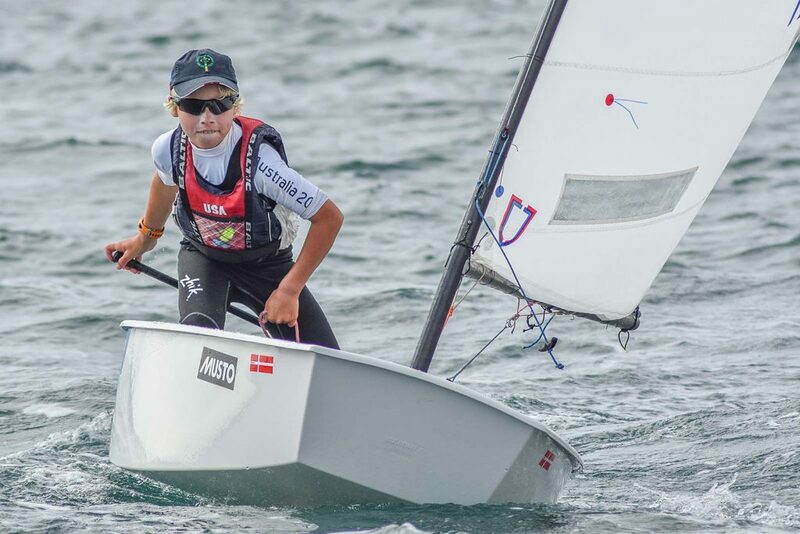 Alexi Wigglesworth, who is also in the 2018 Worlds team after finishing fourth at the nationals for the second year running will also become a two-time worlds sailor in Cyprus. Myles Wilson has shown significant improvement this season and after finishing 17th overall and the 12th Australian at the nationals, he is off to the North Americans in Mexico in June and July this year. Optimist SA president Anthony Roe said those three sailors would definitely be battling it out at the front end of the fleet, however there were several more who could challenge. Quinn Auricht was the overall State Champion for SA Optis last year. “The front end of open fleet will be very tight with Alexi Wigglesworth and Quinn Auricht considered favorites as they are both representing Australia in the worlds team this year,” he said. The Adelaide Sailing Club hosts the regatta this year, which Roe said “has been a long time support of the Optimist class”. Kelly Steel was the first girl in the Green Fleet at the SA Optimist States last year. He said the club was seeing strong growth in its juniors and a lot of success from its Tackers sailing program, which gave season 2018/2019 a great outlook. The Intermediate and Green fleets also have a solid number of nominations this weekend and the constant improvement of these sailors throughout this season and previous years has been great to see. “There has been some great improvements by sailors in the Green and Intermediate fleets over the season at regattas and the coaching clinics have really given them a leg up,” Roe said. Jonas Barrett finished fifth overall in the Open Fleet last year. He also said the class was coming into a big transition time, as Open sailors looked to move on into intermediate classes, while the Green and Intermediate sailors continued to step up. “The class is very excited for the sailors and pleased to set them up with a great foundation of skills into the next class,” he said. Sailing is scheduled at the Adelaide Sailing Club on both days this weekend. For more information visit the class website.